Prominent & Leading supplier and manufacturer from Hyderabad, we offer Laminated Pouches such as Side Gusseted Laminated Pouches, ORS Packaging Pouches and Ketchup Pouches. 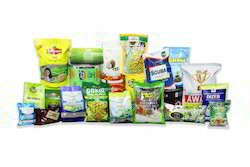 NAMKEEN Packaging Material is developed in matching with the packaging demands of snack food industry. Here, our expertise lies in making use of new and updated technology support to offer highly competitive solutions. Further, we also ensure these matches up with demands of customers looking out for quality packaging materials and exclusive design patterns to meet their product packaging needs. 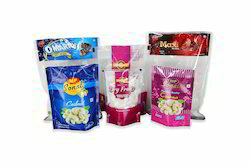 Our domain expertise has enabled us to bring forth Multicolored Laminated Pouches. These are manufactures using premium quality LDPE polyester and advanced methodologies by our professionals. Available in both aluminum and metallic films these are widely used for packing small and medium sized products. Further, we provide customization for the product as per the specifications provided by our clients for their maximum satisfaction. 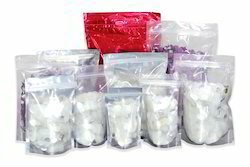 Our prominence in this domain has helped us come up with superior quality Stand Up Pouch Without Zipper . These are manufactured by or professionals using material that has good temperature tolerance. Clients can avail these pouches in both zipper and non-zipper form. Further, we laminate and print these pouches as per their designs and specifications detailed by our clients for their maximum satisfaction. Our prominence in this domain has helped us come up with superior quality Stand Up Pouch With Zipper. These are manufactured by or professionals using material that has good temperature tolerance. Clients can avail these pouches in both zipper and non-zipper form. Further, we laminate and print these pouches as per their designs and specifications detailed by our clients for their maximum satisfaction.